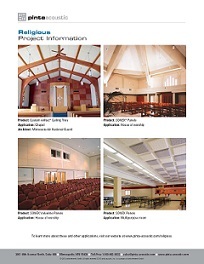 Download or view pinta’s updated religious project information >> This shows pinta’s acoustical products used in worship facilities. This entry was posted in Products, Project Case Studies, Updated Literature and tagged chapel, church, pinta acoustic, religious, SONEX, willtec by pinta. Bookmark the permalink. © 2018 pinta acoustic, inc. All rights reserved.